Deer Hunter: Reloaded is one of the worst hunting games I’ve ever played on a console, and I’ve played a lot of them. It isn’t so much a hunting game as it is a shooting gallery with slow movement, awkward controls, terribly ugly graphics, and bad sound in a shamefully overpriced package. 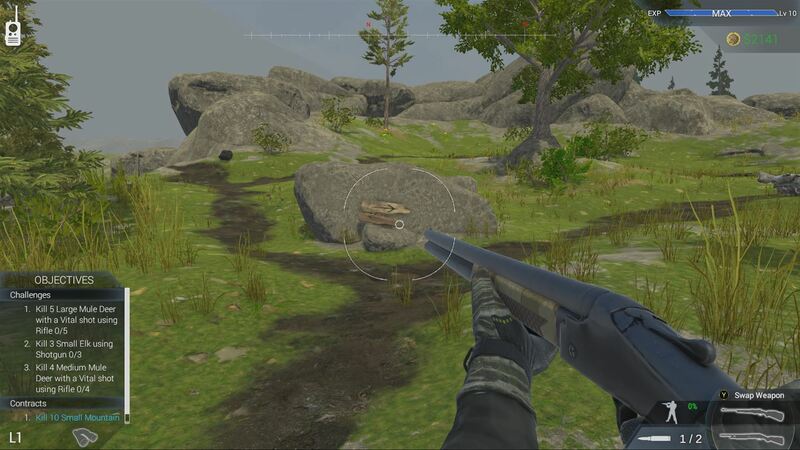 Considering that we got two other solid hunting games on Xbox One and PS4 – Hunting Simulator and theHunter: Call of the Wild - already in 2017 makes Deer Hunter: Reloaded’s ridiculously sub-par release all the more puzzling. I mean, why bother? The Deer Hunter franchise used to be fairly well respected, and it was wildly popular on PC for a long time, but if you buy Deer Hunter: Reloaded based on name recognition alone you’re going to be very disappointed. 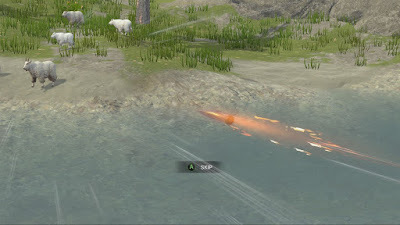 See our full Xbox One Deer Hunter: Reloaded review for more details. Deer Hunter: Reloaded takes you to scenic locations in Texas, Colorado, and Alaska where you can shoot deer, elk, mountain goats, and more as well as do some duck hunting. There are also predator animals that pop up occasionally to attack you that you have to fend off as well. You earn money for every trophy animal you kill which you can then use to buy new guns and upgrades. So far so good, right? When you actually start a hunt, however, everything falls apart. Each location in the game is split into a bunch of smaller zones (like, maybe an acre or smaller each) that consist of set paths and predetermined points where the animals will be. Also, you can’t leave the path or the game scolds you. So you just walk – very, very slowly – back and forth between the shooting points and blast away at anything with horns until they all run off. The A.I. is awful, though, so the animals are usually very slow to react even when you down an animal right next to them. When they do eventually get spooked all of the animals run in a big circular path, which means if you wait long enough (a minute or two) the same animals will be back in the same spot and you can try shooting at them again. You can also easily jump between different zones on the map – each location has a dozen zones or so – on the menu so the game just becomes a big shooting gallery where you clear a zone, move to the next, clear that zone, move to the next, etc.. There is basically zero hunting involved here. Just shooting. 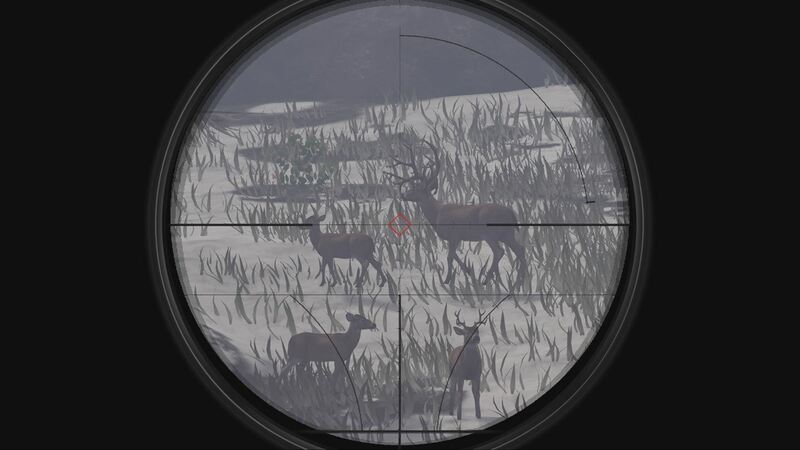 The game does have a progression system where you have to shoot X number of specific animals or kill an animal by hitting a certain vital point, but it all still boils down to a shooting gallery. You need money to buy new guns and upgrades, so you just shoot everything with horns to get cash and the missions get completed along the way. I have to admit that I don’t necessarily dislike a grind now and then and hopping from location to location and just blasting away to blitz through the game’s progression system had the potential to be sort of enjoyable. Any actual fun is greatly hindered, however, by your agonizingly slow movement speed, terrible animal A.I., and the clunky unresponsive controls. It is clear the intention was for Deer Hunter: Reloaded to be a sort of fast-paced and arcade-like alternative to the more serious hunting sims on the market but they blew it. It just isn’t any good. Maybe as a $5 game it would be okay to kill some time with, but at $20 digital and $30 retail Deer Hunter: Reloaded is punching way above its weight class. Hunting Simulator vs. theHunter: Call of the Wild - Which One Should You Buy? Presentation wise, Deer Hunter: Reloaded is ugly. Really, really, really ugly. I want to call it PS2 / OG Xbox ugly, but it looks slightly better than that (there’s less fog here, at least). This was a mobile game to start with, but it would absolutely still be considered ugly on mobile devices. With bad low detail textures, horrific sticks of "grass”, and stiff low-poly animals with bad animation, Deer Hunter: Reloaded is a pretty shameful effort. The sound is also fairly embarrassing as you hear the animals moving around constantly, but their footsteps literally sound like someone crunching on ice cubes. It’s all just so, so awful. Like I mentioned at the top of this review, Deer Hunter: Reloaded is one of the worst hunting games I’ve ever played on a console. Compared to Hunting Simulator or theHunter: Call of the Wild it is just absolutely abysmal and even if you approach it on its own merits as an arcade-style shooting gallery, it still isn’t acceptable because the gameplay is so poor and the presentation is putrid. My expectations were low going in (I mean, just look at the screenshots) but I wasn’t expecting it to be this bad. Avoid. Skip it. Forget it even exists. Deer Hunter: Reloaded is terrible.